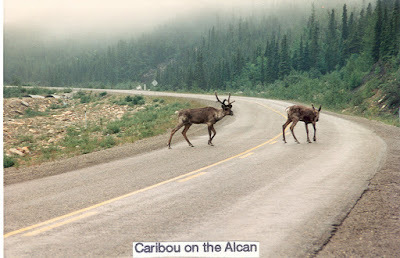 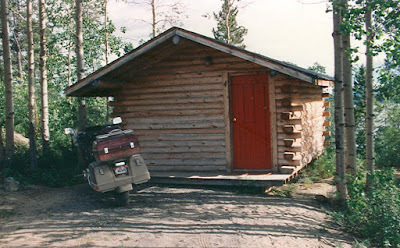 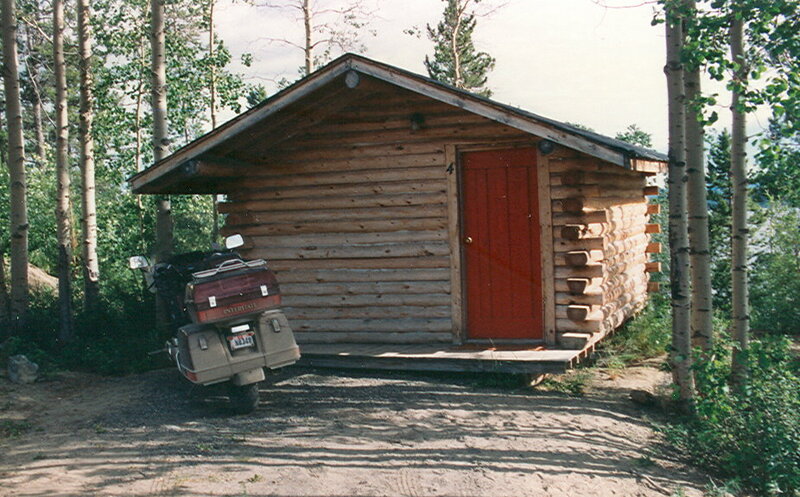 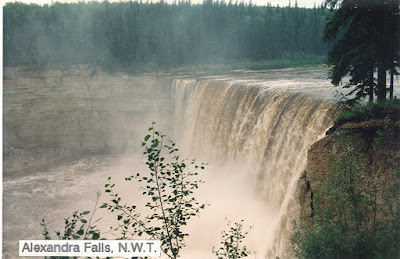 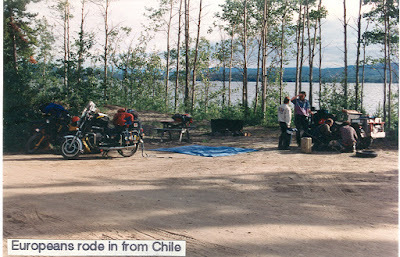 This blog is loaded with stories and photos, including a re-edited version of two of my previously published books, ("Motorcycling Stories from the Northwest Territories to the Yucatan Peninsula" and "Keep Going - The Pleasure and Pain of Perseverance"). 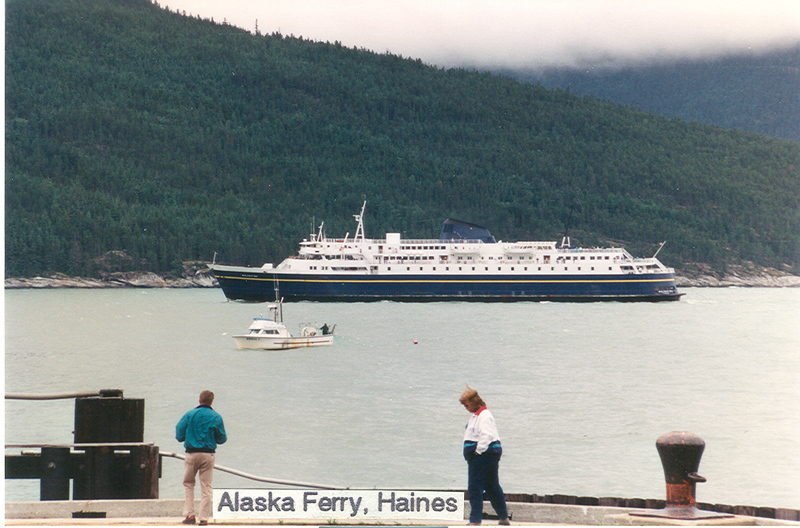 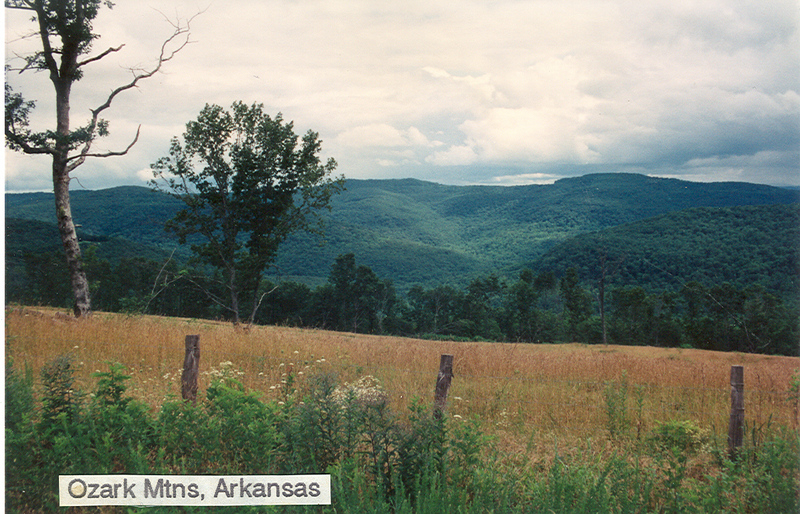 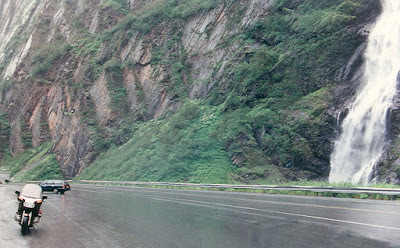 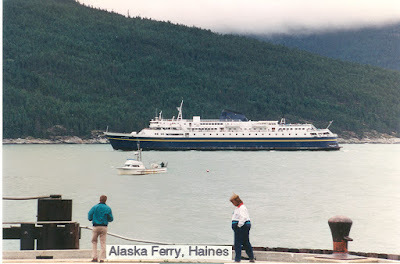 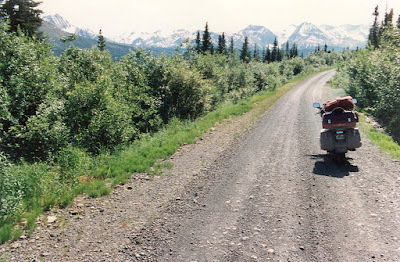 I have included many photos this time, and I have entitled this work, "Adventure Touring". 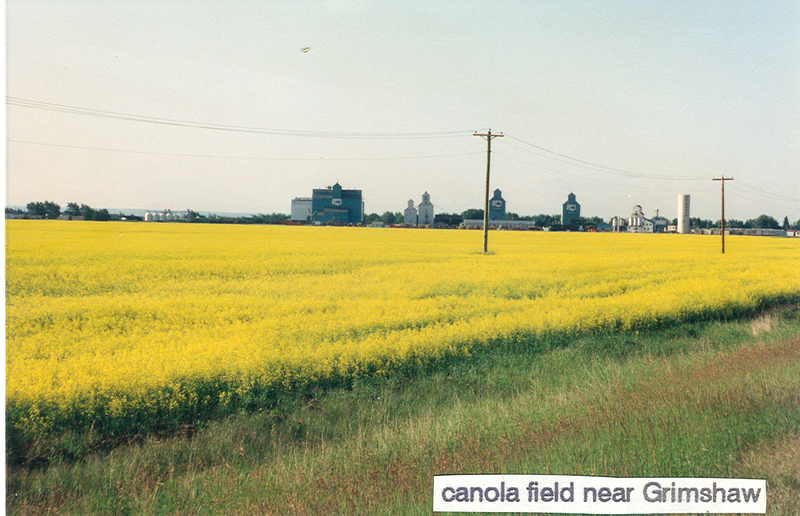 The chapters to it can be found easily by looking in the "Labels" Index in the right-hand column of this blog. 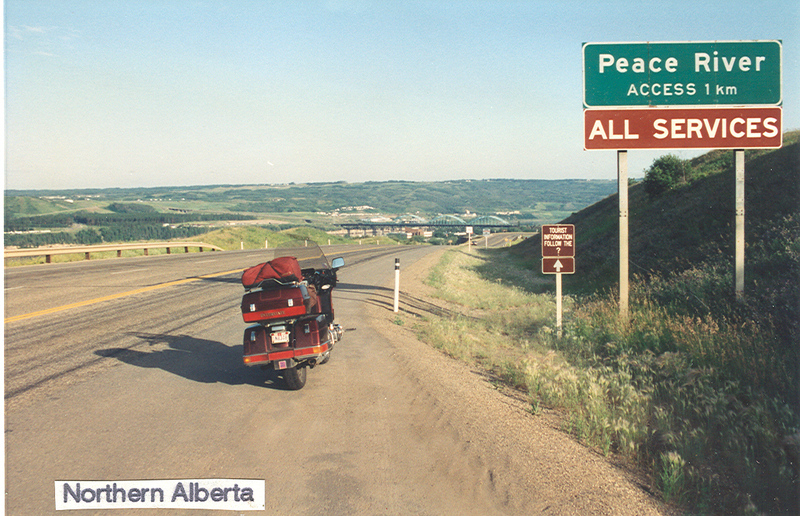 The new book consists of 19 numbered chapters beginning with "01 Adv Touring - Introduction". 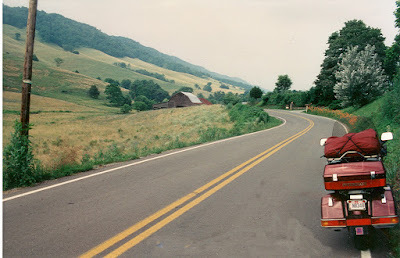 There is a link at the end of each chapter for the next chapter. 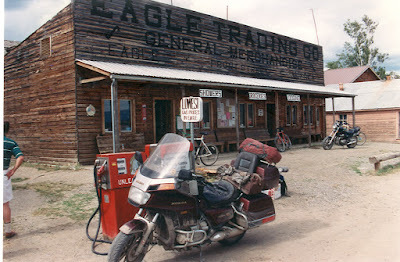 There is a total of more than 1600 photos posted in this blog from 66 years in eight decades of motorcycling since I bought my first Harley in 1947. 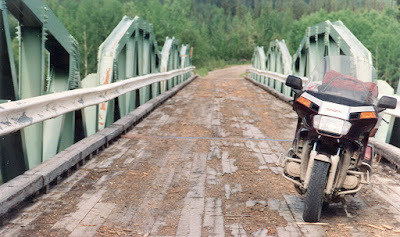 The photos are from many years of enduro competition followed by many years of adventure touring, including eight trips to Alaska over various routes, several back-road tours around the US, one trip each to Newfoundland and Labrador, and two trips deep into Mexico, one of which was to visit the Mayan ruins in the Yucatan Peninsula and the other was to visit the foot of Copper Canyon in the Sierra Madre Occidental Mountains of western Mexico which I did with a Gold Wing! 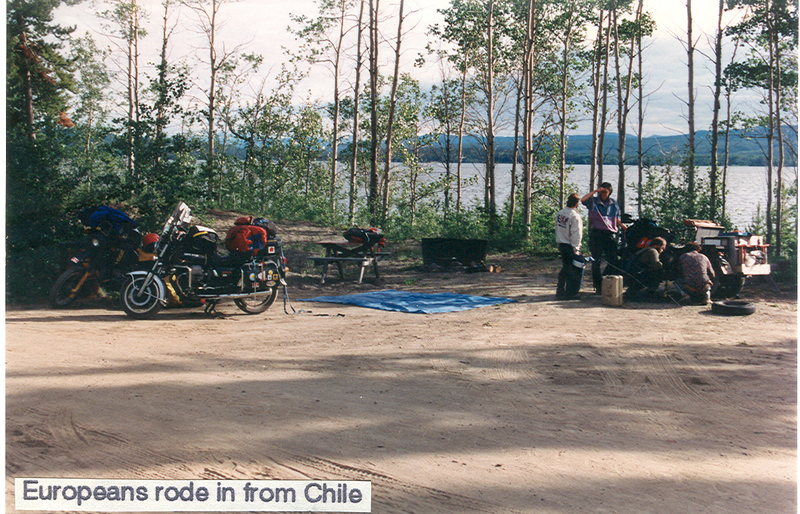 I traveled alone on most of my trips. 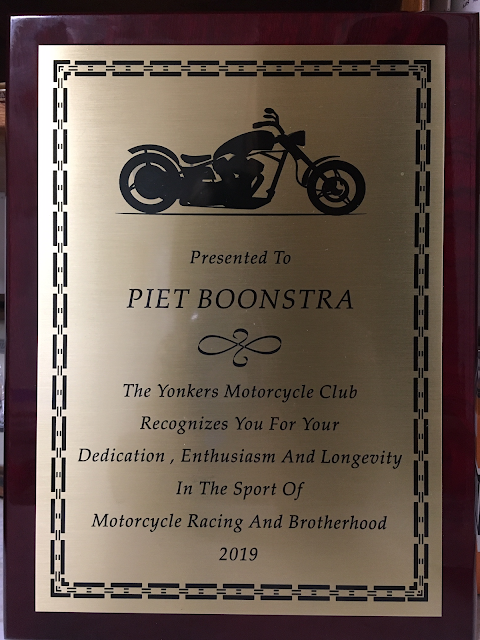 I've also posted photos of my competition in seven decades – primarily in enduros, in which I won trophies in every decade but the first when I competed with my big Harley 74 "Knucklehead" a few times in local events during the late 1940s. 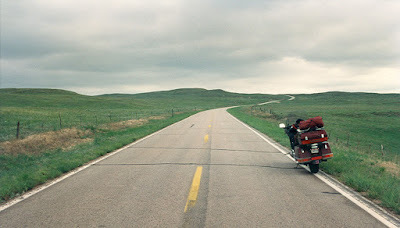 Now I intend to spend more time writing about it and inspiring others to ride – and to keep riding as long as possible. 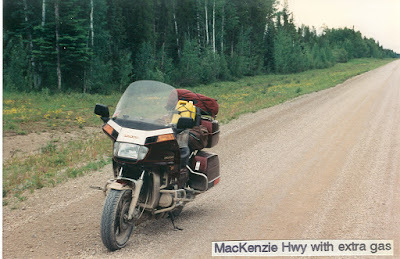 A brief bio with highlights of my motorcycling career is also included in this blog, as well as in the "Adventure Touring" book. 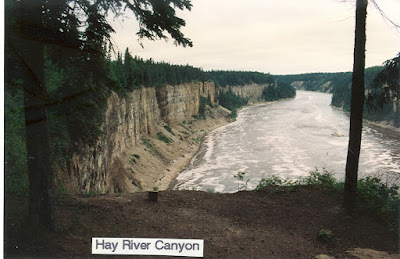 An index of the posts, including the bio and the photos, can be found in the right-hand column of this blog. 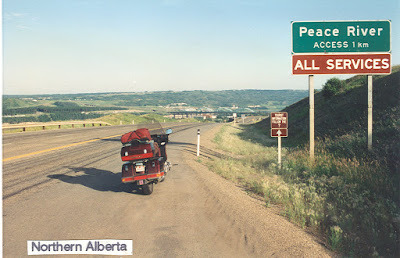 If anyone is interested in purchasing one or more of my books, you can click on the appropriate advertising link in this blog, or if you would rather have a signed copy, please contact me via email at pboonstra@optonline.net and I will gladly sell the book or books to you for the list price with free shipping. 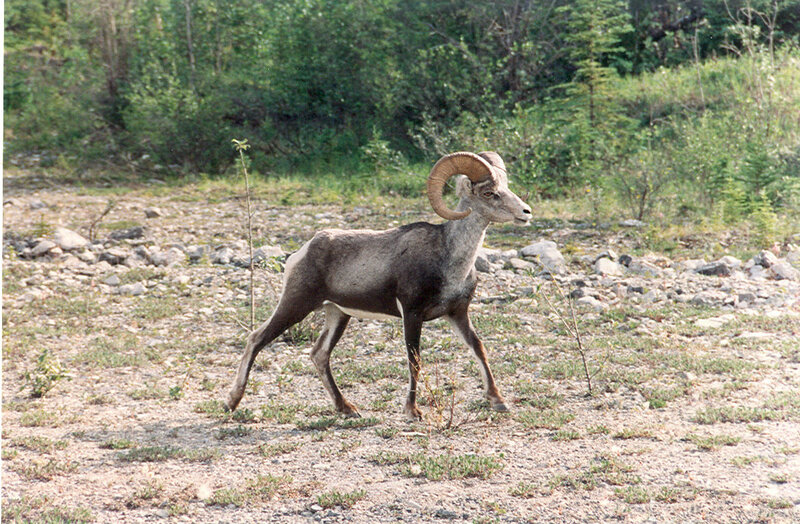 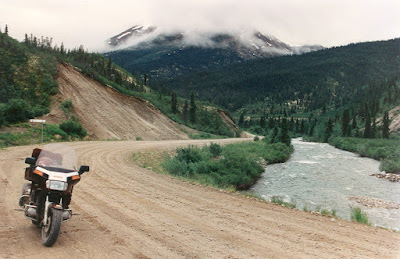 The primary motivation for my 5th trip to Alaska, a year after returning from my 4th, was to take a long solo ride on several remote gravel roads in the Yukon and Northwest Territories that I had never seen, which were mainly the North and South Canol Roads in the Yukon Territory over a totally different route. 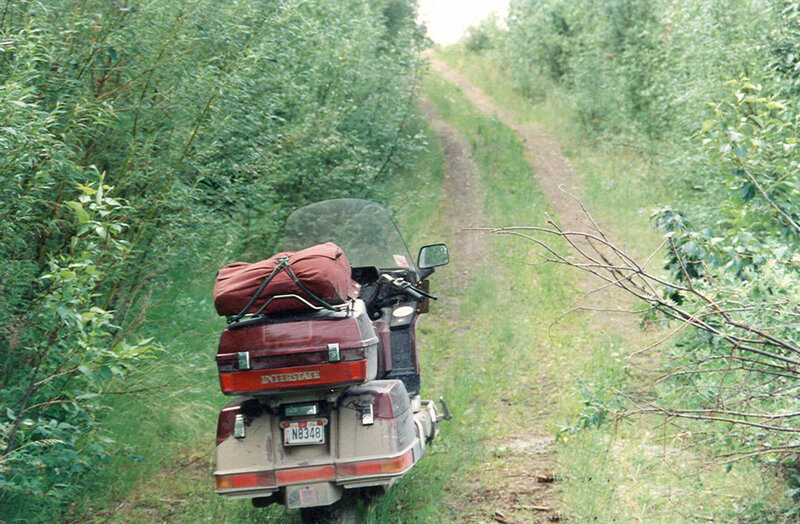 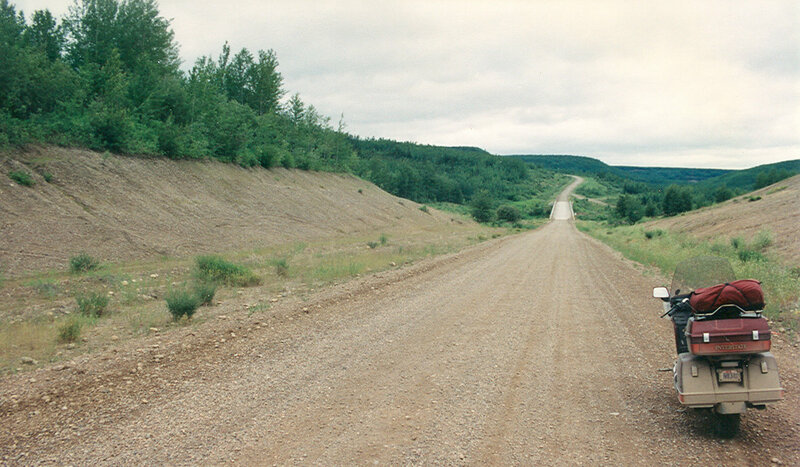 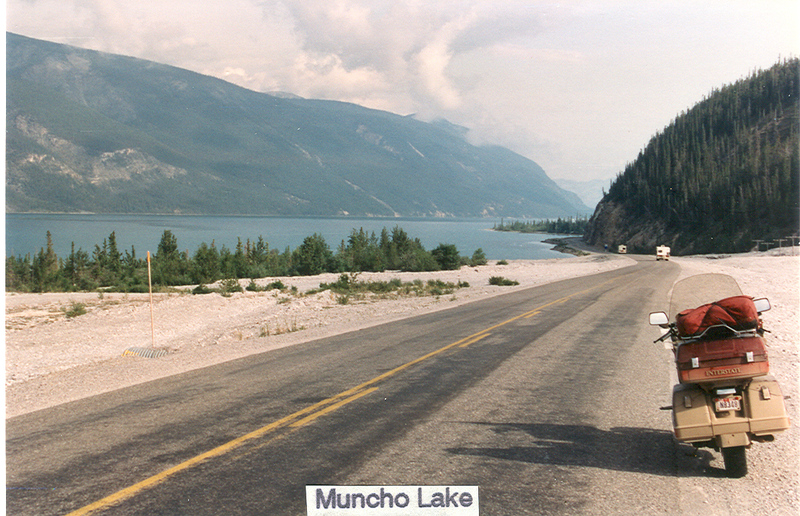 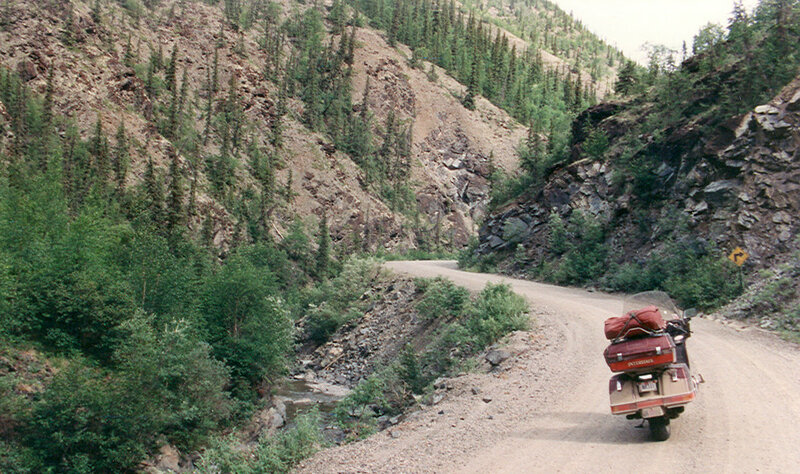 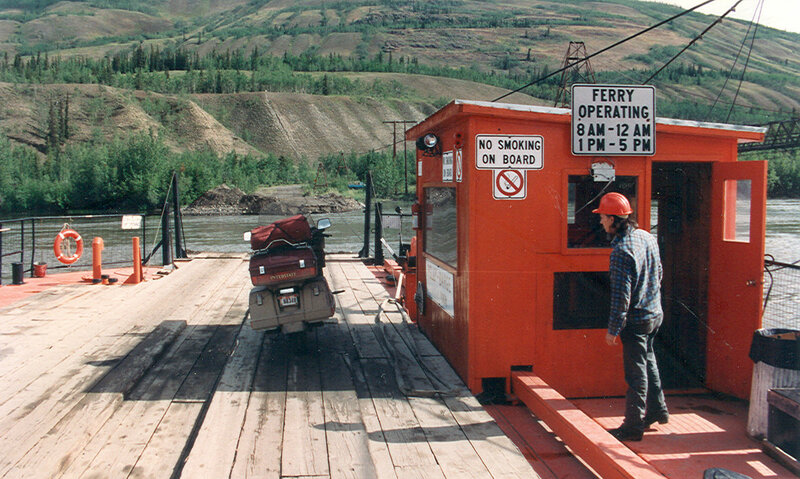 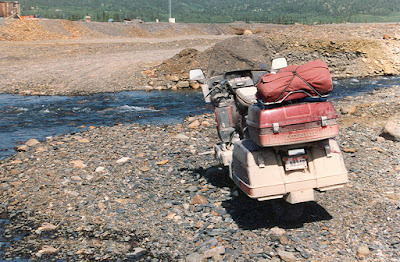 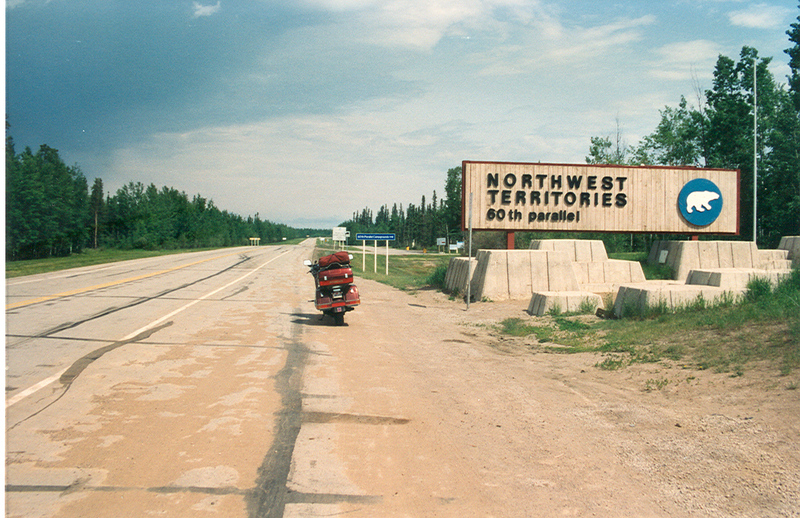 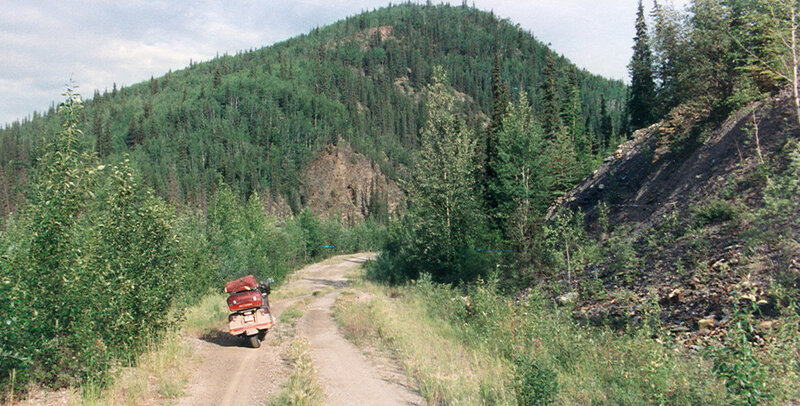 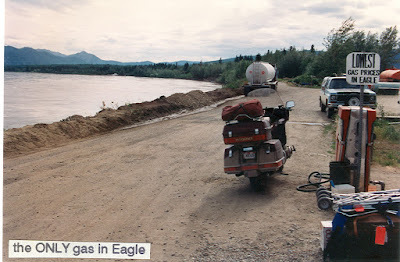 In spite of the Alaska Highway being paved for its entire length for its 50th anniversary, I rode on more than 2,000 miles of gravel roads on this trip with the same 1987 4-cylinder Goldwing I rode on the 1991 trip with four of my friends. 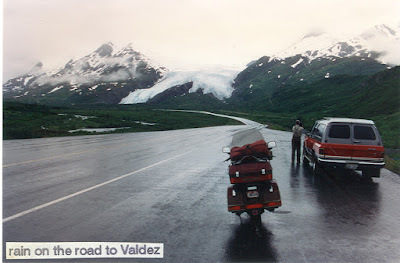 I was most interested this time in visiting other beautiful places where few people have ever traveled. 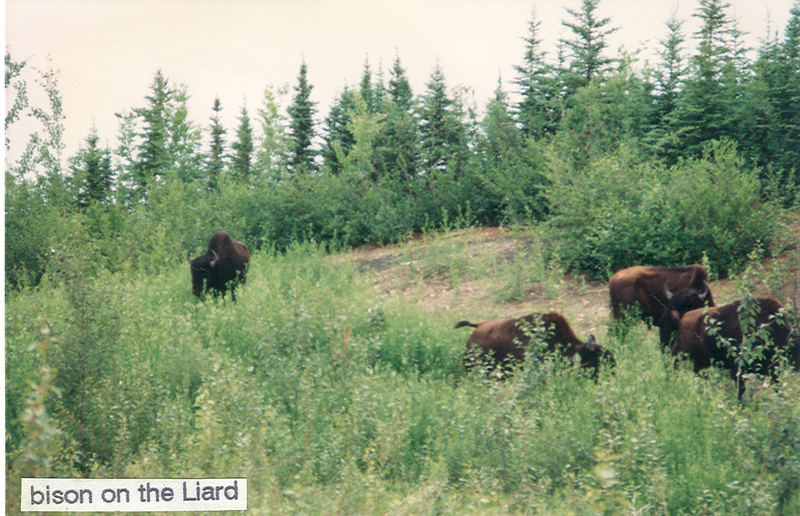 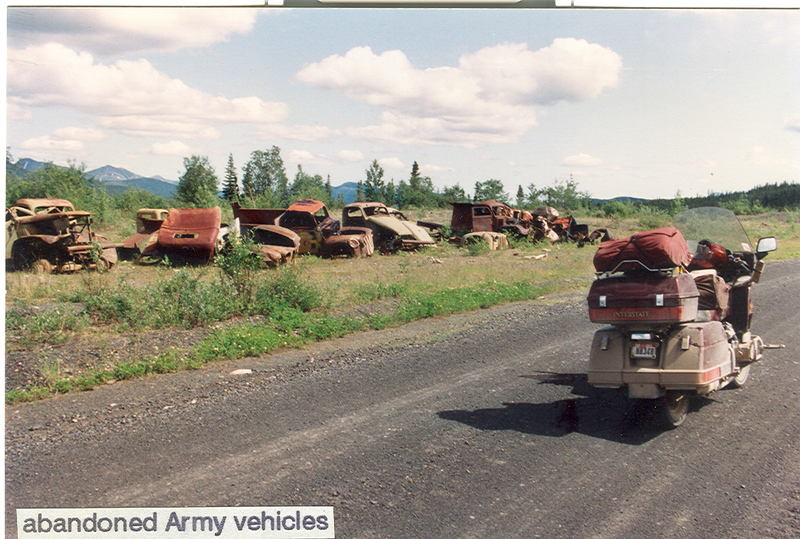 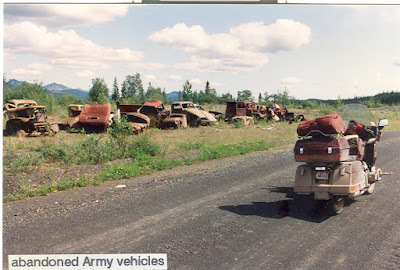 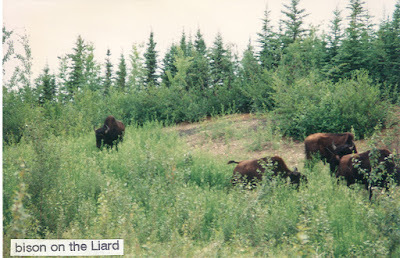 The Dempster Highway and the Prudhoe Bay Haul Road had already lost much of their charm for me because so many have already "been there and done that". 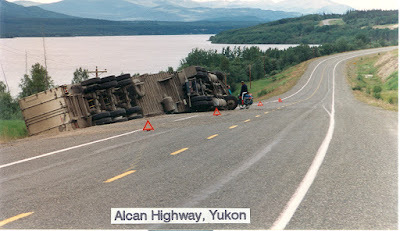 It broke down soon after it took me across northbound. 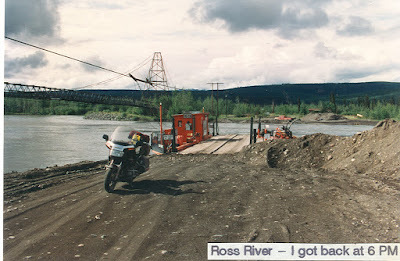 I turned around here due to many rocks in the river - and I was alone. 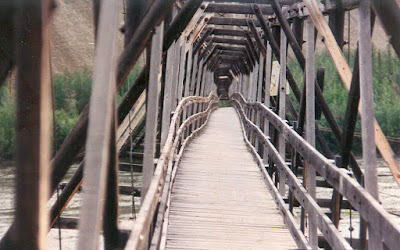 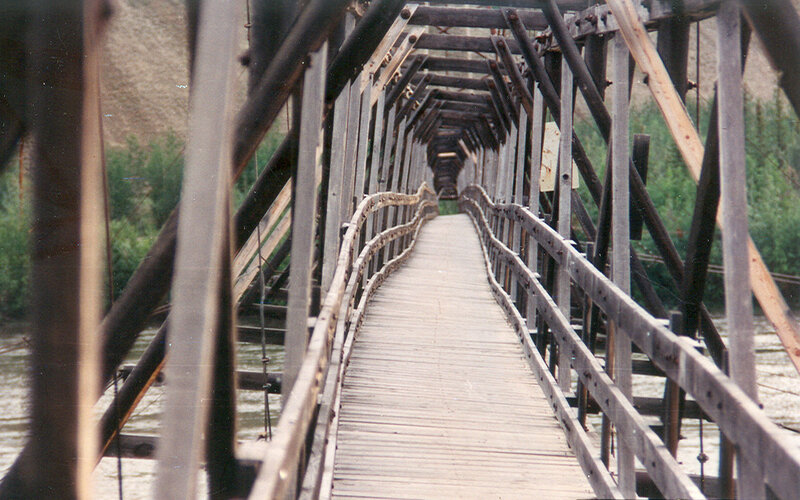 The foot bridge I used after learning the ferry had broke down. 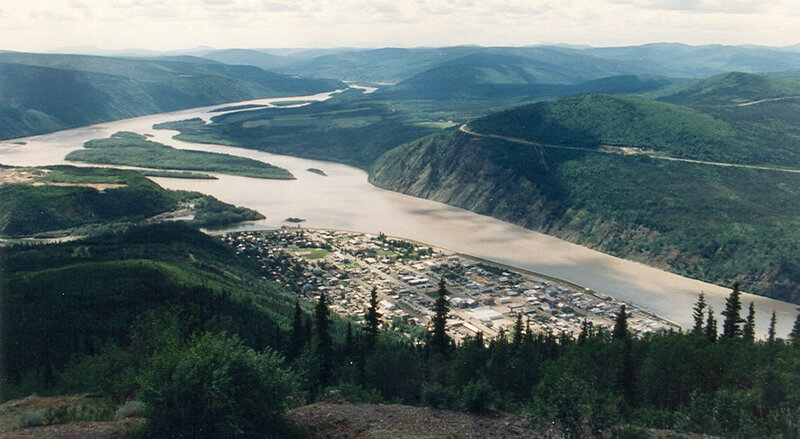 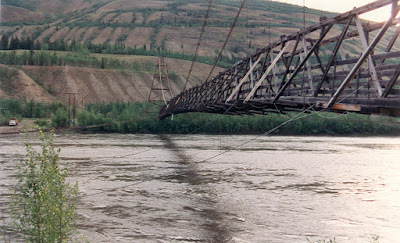 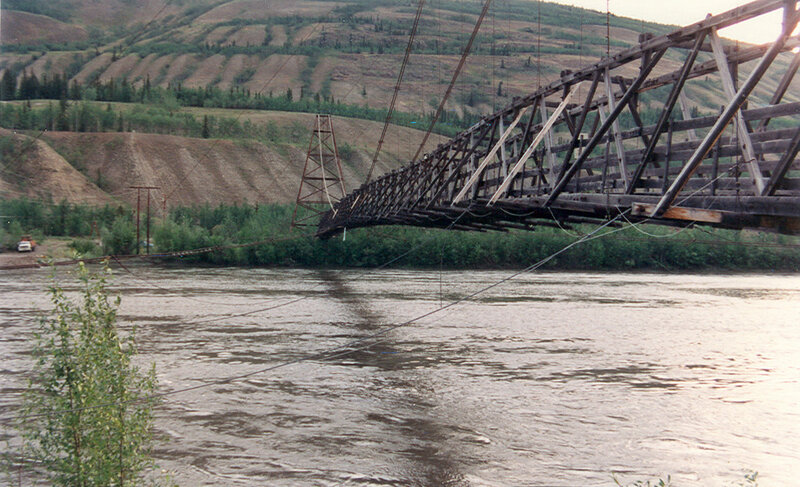 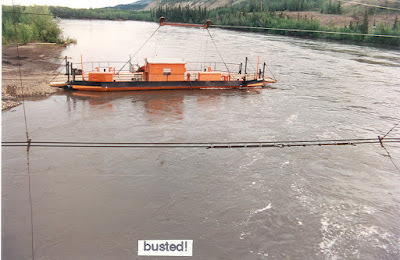 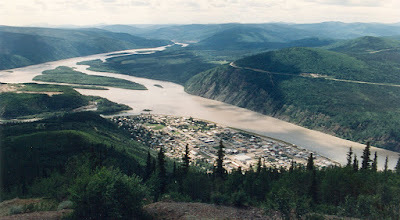 Dawson City, YT at the confluence of the Yukon and Klondike rivers. 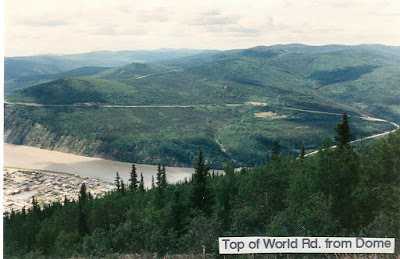 Taken from the "Dome".